Ambassador Blanka Jamnišek currently serves as the Slovenian National Focal Point for the Responsibility to Protect and as the Deputy Head of the Slovenian Delegation to the International Holocaust Remembrance Alliance (IHRA). 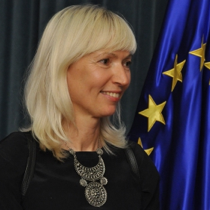 From 2011-2015, she served as the Slovenian Permanent Representative to the United Nations, Organization for Security and Co-operation in Europe (OSCE), and other international organizations in Vienna, Austria. Ambassador Jamnišek attended the 2015 Global Raphael Lemkin Seminar for Genocide Prevention and participated in the 2016 Lemkin Seminar Alumni meeting in Venice, Italy. Sustainable development, including respect for human rights and the rule of law, are fundamental for the long-term prevention of mass atrocities and also for normal economic, social and cultural development in societies that are all more-or-less diverse. We all have to learn to live in this diversity and to address life challenges peacefully and in true cooperation with each other on the basis of norms and standards which have already been approved (inter)nationally, in most spheres of life. All kinds of activities for different target groups, especially children and youth – our future leaders and policy makers – can contribute to raising awareness on the need for respect towards other people, other cultures, other life philosophies, etc. No one should be left behind, not only in the developmental sense, but also with regards to efforts made in raising awareness about the inherent equality of each and every person and about human solidarity. Today, in the 21st century, there is still a very long way to go to reach these noble goals. Everyone should play his or her part by taking responsibility. This includes the international community and its numerous multilateral organizations, national governments, and civil society; even individuals have a role. All people can work towards making this world a much better place. Atrocities can and should be halted and prevented anywhere that they are still happening. At the moment, there are still too many hotspots in the world where populations are suffering terribly. Please just allow me to point to the suffering of the people in Aleppo at this very moment. To learn, intensively, everything about conflict cycles, from the past and in the present, in order to be able to prevent future atrocities. A very useful tool for prevention is the UN Framework of Analysis for Atrocity Crimes, which has been issued by the UN Office of the Special Advisers on Genocide Prevention and the Responsibility to Protect. It thoroughly describes common and specific risk factors, indicators, and possible triggers that represent processes that can lead to atrocities. With this knowledge, officials cannot ignore certain signs that signal preventive action should be taken. Prevention should be done in all phases of a conflict cycle. Prevention before the outbreak of conflict is best, as it can change the process and potentially stop the conflict from ever occurring. But, even if it does, preventive action remains necessary during the conflict to minimize its effects. Sometimes this works well and results in shorter conflicts with fewer casualties as well as limiting other potential negative effects. After the conflict ends, there is usually a long period of transition and reconciliation. This phase also requires a lot of preventive action, as many historical post-conflict situation have shown. Every official has the duty and responsibility to confront indicators and signs of risks, as well as triggers. They must prevent atrocities and not look away. Everyone with the power to act, not only individuals who are professionally involved with the Responsibility to Protect (R2P), should be aware of possible negative trends and should confront them within the scope of their responsibilities. Looking away, ignoring situations, and staying within your own comfort zone can be very dangerous, as history has demonstrated many times in many places. What are some of the recent initiatives and/or programs that you have worked on in Slovenia that you feel have had the largest impact? After my posting as Ambassador of Slovenia to the UN, OSCE, and other international organizations in Vienna from 2011 to 2015, the Slovenian Government appointed me as their Focal Point for the Responsibility to Protect (R2P), as this is one of Slovenia’s foreign policy priorities. I also became the Deputy Head of the Slovenian Delegation to the International Holocaust Remembrance Alliance (IHRA). One of my favorite assignments is the promotion of human rights education. In 2005, I designed a project for children, which is actually still ongoing. Over the past ten years, 185,000 children in 26 countries (on almost every continent), many of them in post-conflict societies, have taken part in the “Our Rights” project, which has been offered in 22 languages! So, in my present assignment, I work on many levels of prevention. In the area of R2P, I co-organized the first observance of the International Day of Commemoration and Dignity of the Victims of the Crime of Genocide and of Prevention of this Crime on December 9, 2015. In January of 2016, we supported the Festival of Tolerance, held in our capital of Ljubljana. The Festival addresses contemporary manifestations of intolerance (hate speech, etc.) against all kinds of groups, including refugees and migrants. In cooperation with the Synagogue of Maribor, our Ministry of Foreign Affairs supported a number of events in January of 2016 under the umbrella project “Shoah- let us remember” and also those surrounding Holocaust Remembrance Day. In the spring of 2016, we translated the UN Framework of Analysis for Atrocity Crimes: A tool for prevention into the Slovenian language. Over the next few months, we are planning awareness-raising events with different stakeholders (policy makers, officials, academics, students, NGOs, etc.). I believe that human rights education represents a very promising tool for prevention that can have a systematic and powerful effect. I recently worked in support of a pilot project that used the “Our Rights” teaching tool in India. This project was carried out in cooperation with an NGO called Bachpan Bachao Andolan, which was founded, and is led, by 2014 Nobel Prize winner Kailash Satyarthi. With our support, the same project will be soon be running in parallel in Kosovo and Serbia. Another activity I would like to point out was the preparation, production, and distribution of 40,000 copies of a learning kit based on the “Our Rights” project. The learning kit, which was produced in response to the huge influx of refugees that Slovenia has been experiencing since the autumn of 2015, explained the universal rights of refugee children. Raising awareness among members of the majority population about the universal rights of refugees is essential to building an atmosphere of acceptance and normality and to the prevention of negative trends, which are observed just about everywhere. It is essential to enable young people, particularly children, who are still developing their identities, to learn about human rights (i.e. their own rights and the necessity of respecting the rights of others). Education on universal human rights enhances one’s understanding of the diversity of human society, including religious, ethnic, cultural aspects and the situation of national minorities. Inter-cultural and inter-faith respect should be promoted in conjunction with this type of education. Learning about human rights and respect for others helps us to build societies that value tolerance, respect, and non-discrimination. On a personal note, what was the most important element of your visit to Auschwitz-Birkenau? My Slovenian nation, which now numbers 2 million people, suffered severely during WWII. The number of victims was 6.6% of the population, which is very high for a small nation like ours. Literally every family had a member who was as a refugee or migrant, victim in a concentration camp, held in detention or in a forced labor camp, kept in custody as a prisoner of war, or who was killed as a hostage. As many as a 1,000 children were taken from their families and sent to German families. 58,522 people were held in a variety of concentration camps in Germany, Italy, Austria, Croatia, and Hungary. Out of the 12,360 Slovenes who died in concentration camps, 1,331 died in Auschwitz-Birkenau, in the same tragic way as the other victims of the camp. The visit to Auschwitz-Birkenau was very educational and emotional for me. I am very grateful to AIPR for inviting us there, on the scene, to feel, hear, and see the aftermath of those horrors of humankind. At the same time, I felt a great need to advance the preservation of the memory of the victims, as some have already been forgotten. All victims deserve to be remembered. These memories should mobilize us and the future generations of all nations to ensure that it never happens again, anywhere. We owe this to each of the victims and to our children, all of them. Actually, many people inspire and motivate me… everyone that tries to advance humanity and change things for the better. My personal motivation is also to contribute to the sustainable development of humankind, especially with regards to our younger generations. This was also my motivation in designing the “Our Rights” human rights education project for children, which has served many throughout the world over the past decade. Education and training in human rights is a lifelong process. If effective, it can prevent violations of these rights by promoting a culture of peace, non-discrimination, and tolerance that is anchored in a respect for universal human rights and fundamental freedoms. Children in every environment must be given the opportunity to learn about human rights and must be guaranteed their own rights. They must be included in efforts aimed at promoting their empowerment, which will contribute to their healthy development and also to long-term preventive action. These activities can help prevent atrocities. A person that understands the concept of respect for human rights usually chooses not to take part in these crimes. Therefore, I will continue to put effort towards prevention activities, both in the context of human rights education as well as the Responsibility to Protect.